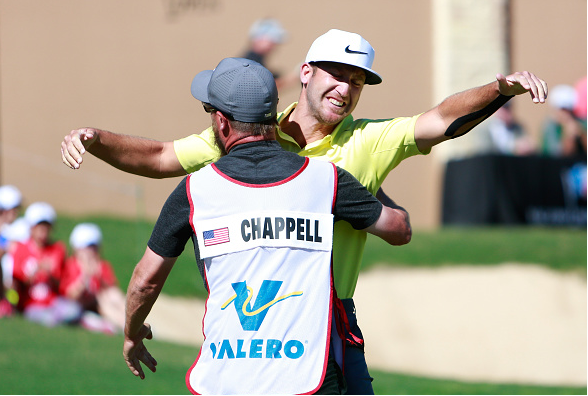 Kevin Chappell finally got the monkey off his back to capture his first PGA Tour victory. Chappell’s birdie at the last capped off a final round 68 to hold off Brooks Koepka, who fired a final-round 65. Kevin Tway and Tony Finau finished tied for 3rd at 9-under. Rounding out the Top-5 was Aaron Baddeley, who carded a 68 to finish at 8-under. To wrap up coverage of the Valero Texas Open, let’s take a look back at the three best shots. Chappell came into this season riding his best year on the PGA Tour – four runner-up’s, one 3rd, eight top-10’s, and over $4M in earnings. After sinking this 8-foot birdie putt, Chappell finally got the job done after 6 years on the PGA Tour. The par-4 17th was playing pretty easy in the third round, as the 318-yard hole was playing down wind. However, Huh put himself in the green side bunker after his tee shot. Huh made the tricky bunker shot look fairly easy by jarring it for an eagle. Huh went on to finish T-22 after 5-over 77 on Sunday. In the first round, Duke hit his approach shot into the par-5 14th’s green side bunker. Duke faced a 25-yard bunker shot and made it look simple. The shot. The reaction. What a highlight. Duke had a great reaction to holing this bunker shot but a sluggish weekend of 79 and 75, Duke finished T-58. Drew is a Pro Golf Weekly Contributor.